Some wonderful music continues to come out of Western Australia. There is definitely something in the water over there. The latest in a long line of exciting releases is Kohesia, the debut album of bassist/composer Kate Pass‘s Kohesia Ensemble. The Ensemble’s sound and Pass’s compositions mix jazz timbres with Persian (Iranian) sounds and melodic concepts (I choose to think of it as Persian rather than the more modern Iranian because this music seems to speak with a voice that summons timeless and multi-hued, multi-patterned visions). However, Pass’s compositions and musical palette are far from mere exotica – in fact, the conversational mix of Western and Middle-Eastern musics could not be more timely, with the current world schisms and tensions between the two cultures. To hear these voices side-by-side, talking and twining together is an almost political call for hope – one where neither side sees the other as the “other”. And that is the gift of Pass’s writing – the range of ways she mixes the two disparate and quite unique timbres together: on ‘Journey to A Faraway Place’ she fuses Ricki Malet‘s trumpet and the ney (wooden flute) of Esfandiar Shahmir into an intriguing hybrid voice over arco bass; on the 5/8 groove ‘Point of Departure’ the same two instruments answer each other, as if in a conversation that spans the centuries across a barline; on opener ‘Nahafsi’ the tenor sax of Marc Osbourne is answered by Mike Zolker‘s nasal yet sinuous oud. The writing fits the phrasing and execution to the mood: ‘Nahafsi’s microtonal grace notes pull against the hem of the melody; the changes of ‘Origins’ are either folk changes if played by the ney, or jazz changes when the tenor takes over. ‘Schplur’ reminds one of a Horace Silver hard bop groove – a groove which holds up just fine under the oud solo. Pass’s intelligent and soulful bass improvisation here is informed by her compositional skills in its shape and momentum. Drummer Daniel Susnjar pins the whole performance down with customary taste and fire. Susnjar also produced Kohesia, as well as enlivening the album with his superlative playing. His solo over ‘Schplur’s faux-montuno and his jabbing and jibing comp under Chris Foster‘s sparkling piano solo on ‘Origins’ are high points. Kohesia has been nominated for a slew of awards and The Ensemble have been invited to play major national festivals. It is no surprise: from Elle Deslandes‘ and Reza Mirzaei‘s beautiful and apt package design down through the album’s production, mixing and mastering, Kohesia is excellence, pure and simple. The poem inscribed on the inner sleeve is by 14th century Persian poet Hafiz. It reads: “We’ll crack the Heavens’ vault in half and hew a wholly new design”. With Kohesia Kate Pass has created a fascinating new voice by less violent, but just as powerful, means: this music comes from a heart that seeks beauty and a heart that seeks peace. When it comes to new music, most times I have to go looking for the good stuff. But sometimes the good stuff comes looking for me. Lunching with my wife at Hobart’s MONA on the last day of a holiday in early January, I was transfixed by the music wafting like a perfumed breeze up from the stage in the greenspace below. I made a mental note to discover who made such lovely sounds and which instruments gave it its unique musical tang. But not long after returning to Sydney, John Robinson – oud master ­– sent me out the album of his new project, Horse & Wood. It was he and his musical partner, Bukhchuluun Gangburged who had made the music that I had heard and loved at MONA. Robinson, I knew from various performances in diverse settings – even including jazz collaborations – and have long been aware of his mastery and great soulful flair on al’ Oud (‘the wood’ in Arabic). 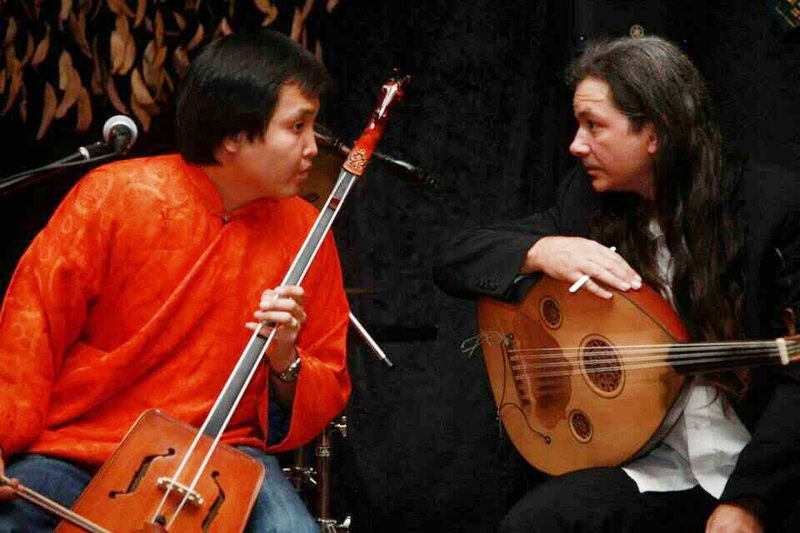 Gangburged’s instrument is the Morin Khuur, the Mongolian horse-head fiddle, and so the name of their collaboration, and of their debut album is, fittingly and simply, Horse & Wood. Horse & Wood is the new fruit of Robinson and Gangburged’s coming together at the 2011 Woodford Folk Festival. Working from a traditional folk base, the two spin their music out in many directions – after all, these instruments were not born to play together, so you have Mongolian/Turkish fusions, Mongolian/bluegrass mash-ups and even a Mongolian/Hot Club meld of the Gitane-smoky gypsy jazz standard ‘Dark Eyes’. It all works beautifully because at its heart is folk music – that music that is without vanity, that music which tells tales of the everyday, tales of the unchangeables such as birth, weather, pain, wild wedding parties and graves on windswept bare grassy hills. Gangburged’s fiddle adds a beautiful, mellow colour to the music but his singing is what astounds. As well as a naturally warm voice, he also uses the technique of Mongolian Khoomei or throat singing. My soft, pink Western ears initially found its guttural texture rough and often harsh, but on the next listening I could hear the veins of wood, the rough skin of stone, the weathered leather of saddles in its grain. And when he switches to harmonic singing – a dark-toned whistle that is as unearthly as it is transporting ­– I hear wind through pine needles, shaking off snow. Whenever I hear music that has deep, deep roots in folk music, there is a small moment when its depth and lack of vain pride makes most other musics – jazz, classical, the more puffed-up forms of rock and roll – seem absurdly pompous and cloying, overworked with messy filigree. Of course that moment passes, but I am left with a small barb, a little ache for that sweet simplicity. 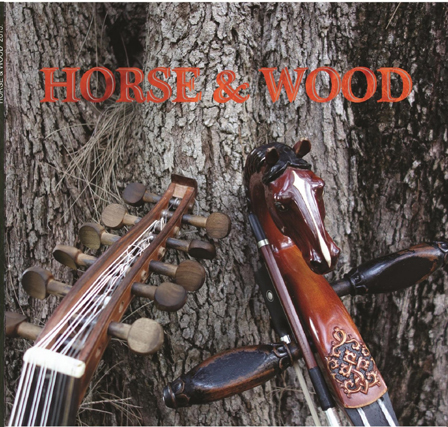 Horse & Wood, the duo and the album, soothes my ache just that little bit. It is already a favourite.